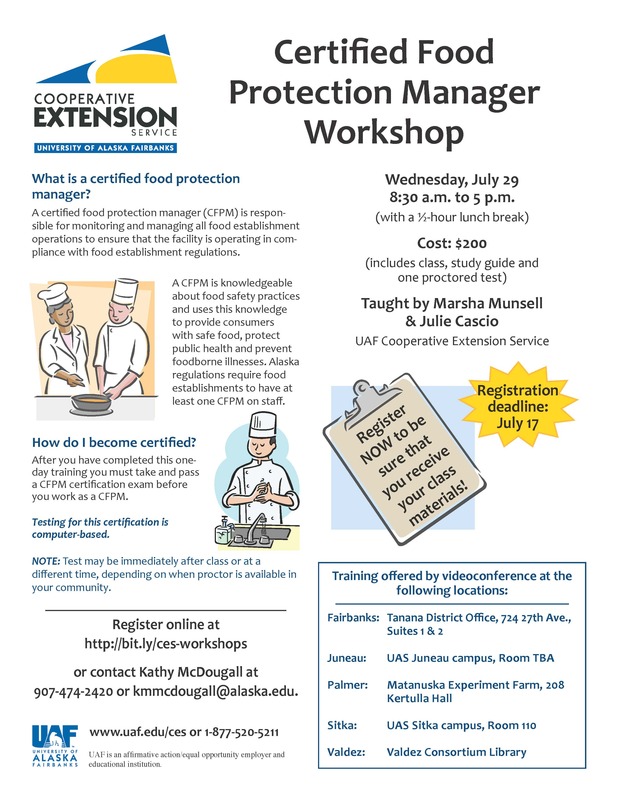 Thursday, July 17, is the registration deadline for a certified food protection manager workshop being taught on Wednesday, July 29, by University of Alaska Fairbanks Cooperative Extension Service. This is an all-day statewide class that will be offered by videoconferencing to Fairbanks, Palmer, Juneau, Valdez, and Sitka. This course takes place from 8:30 a.m. to 5 p.m. (with a half-hour lunch), and participants will take a computer-based exam at the end of the class. The reason the deadline is two weeks before the class is to guarantee course materials reach all the students in time for the class. The cost is $200, and the course will be taught by Marsha Munsell of Fairbanks and Julie Cascio of Palmer. Students can register here (scroll down and select the July 29 item). The Sitka videoconference for the class will take place in Room 110 at the University of Alaska Southeast Sitka Campus. To learn more, contact Jasmine Shaw at the Sitka District Office of the UAF Cooperative Extension Service at 747-9440, or contact Kathy McDougall at (907) 474-2420 (Fairbanks number) or kmmcdougall@alaska.edu. Note, this class is taught in English but textbooks are available in Korean, Chinese and Spanish, just contact Kathy at least three weeks before the class. Jasmine does have one extra book in her office, so she can accommodate one late registration from Sitka for the July 29 class. The next class will be Sept. 30, and Sitka is a tentative site for the videoconference. Also, the ServSafe book ($60) and certification exam ($75) now are available online, if people want to order the book and study independently without taking the class. Just go to this website and purchase the book and exam items. This entry was posted in education, Food choices, food safety, food security, Local food in the news and tagged certified food protection manager (CFPM), education, encouragement, Fairbanks, food safety, Jasmine Shaw, Julie Cascio, Juneau, Kate Idzorek, Kathy McDougall, Marsha Munsell, Palmer, produce, public health, restaurants, Sitka, UAF Cooperative Extension Service, Valdez. Bookmark the permalink.